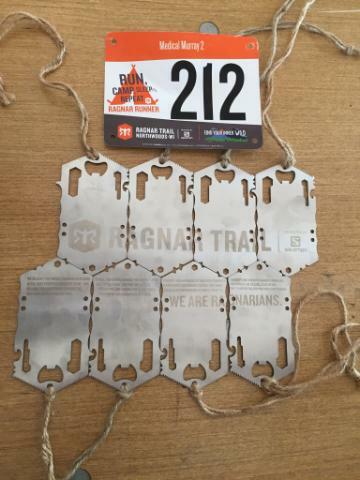 After the last Ragnar I did in 2013, I claimed that I was never doing one again. Twice was enough thank you very much. 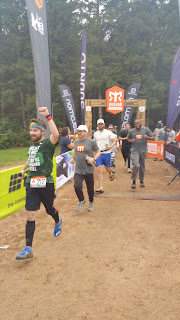 Three years must be long enough for me to forgot all about that declaration because when my boss signed up up for Ragnar Northwoods in May, I volunteered to run. 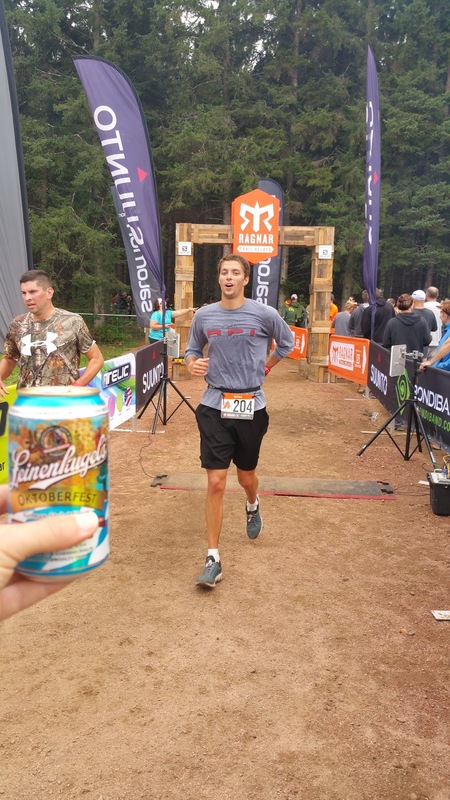 This race was a mere 2 weeks after Ironman Wisconsin and I did exactly 0% dedicated training for this race. 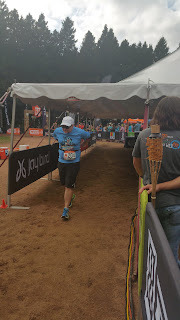 In fact, I didn't run a single step between the 2 races. I figured I would be fine. How hard can running a few miles on trails be? Oh Alyssa, you poor naive soul. 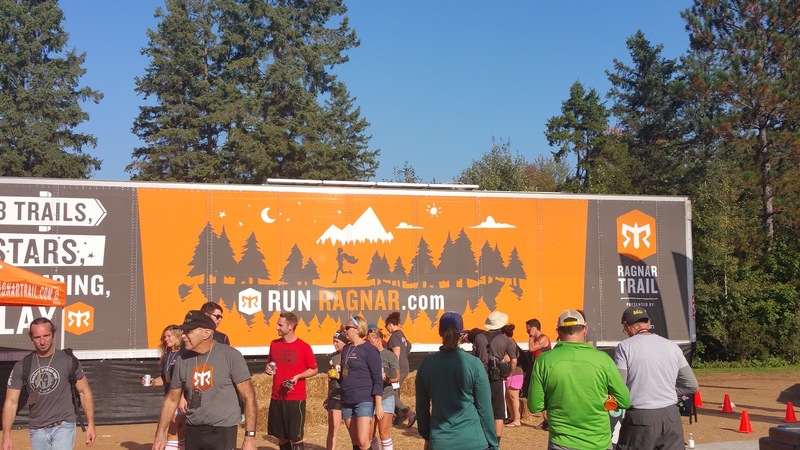 Ragnar Trail races are a bit different than the typical Ragnar road relays were you are cramped in a van while you run 200 miles to a different city. The standard team has 8 runners and they each run 3 times. But instead of unique legs for each runner, everyone runs the same three loops one time each starting and finishing at the Ragnar Village. Each team has a campsite near Ragnar village and we were able to spread out and relax and get some sleep! Ragnar Northwoods was held at Nine Mile Forest in Wausau, Wisconsin about a 4 hour drive from Illinois. Our team starting time was Friday afternoon so 3 of my coworkers and I headed up Friday morning with our camping and running gear. The word "trail" leaves a lot of room for interpretation as most trails I've seen in Illinois are forest preserve trails covered with crushed limestone and are wide enough for 3 people to run side-by-side. Plus the hills in Illinois are closer to non-existent. So I was hoping for some easier 'trails' and instead found some rocky, rooty, single-track trails. I was runner #1 for our team and got to start on the easy green loop for 3 miles. The loop started off nice and easy on a wide grassy fire road but quickly turned onto a tough single track. I was trying to keep up the effort level but my legs weren't as cooperative on the trail and about two miles into run, I caught my foot on an exposed root and went sailing through the air before basically belly-flopping onto the ground. I laid on the ground for a few seconds assessing the damage but only my pride was injured and so I got up and started running again. I handed off to my coworker for his 4.5-miler. His leg went smoothly and he handed off to my boss for his long 7.6-miler. Only 1 mile into his leg, he tried to turn a corner and rolled his ankle and had to get picked up by the injury mobile. So the rest of my teammates scrambled to fill his legs. I was able to skate by without having to run any extra legs! Our team continued to make our way through the line up. The rest of the team just lounged around back at our campsite. 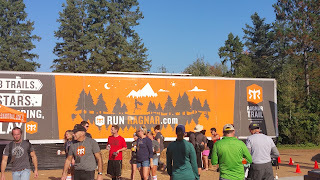 Ragnar provided a free pasta dinner to all the runners so around 6 pm we grabbed some dinner. And then I waited. And waited some more. The time between the first 2 legs seemed to drag on possibly because it felt like we were still so far from the end. After dark, the village had a large bonfire with free s'mores that I definitely took advantage of. I didn't start running again till 9:40 pm for my 7.6-miler. I don't have any pictures of this time but just imagine me running through the woods Blair Witch Project style and breathing heavily into the camera and you've got the idea. Of course, I carried a flashlight but trails + dark = really tough. A lot of this run was on the grassy fire road and I was able to actually run most of that, but when we got onto the trail part, I walked. I wanted to live to tell about this adventure and not crush my head on a rock trying to be a hero. 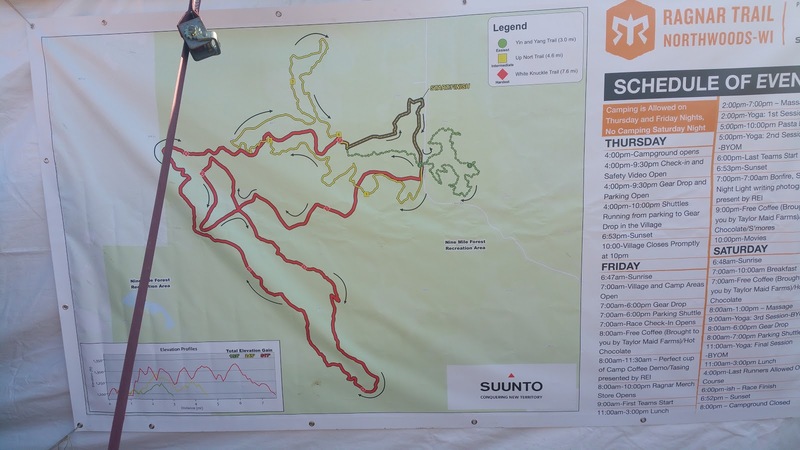 Once the single-track trail portion ended, the runners were spit back out onto the fire road and ran back to the village from there. In the preceding days before Ragnar, the Wausau area had received quite a bit of rain and it showed up here. It was wet. And that mixed with a grassy trail plus tons of runners equaled one hot muddy mess. So I walked a lot of that too. Later one of my teammates actually lost her shoe to the mud. 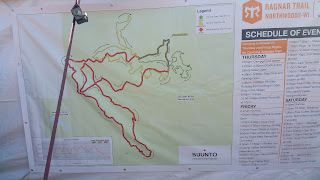 One of the best things about the trail race is getting to spread out in a tent and lay down and get real sleep. It was a little bit chilly out and I had to sleep with a hat on but it was much more comfortable than sleeping in a van. Around 6:45 am, I started my third and final leg. Thankfully the sun was coming up and I was able to run in the light! 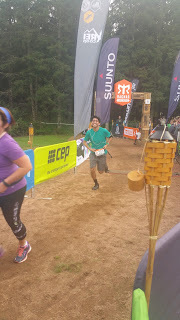 My legs were pretty stiff and the run was a bit of a struggle but I made it to the end! The rest of my team still needed to run the rest of their legs, so I hung around back at the campsite and rested up. When we were nearing the end of our race, we packed up the campsite and got everything loaded in the cars so we were able to leave immediately after our finish. 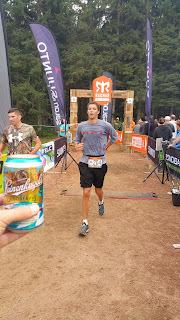 Ben requested I have a beer waiting for him at the end of his last leg. I obliged. 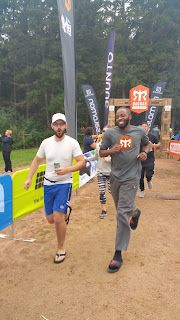 My company actually had 2 teams signed up for the race so we cheered team 2 into the finish! Our last runner came in and we wall ran towards the finish line! Overall it was a pretty fun race! 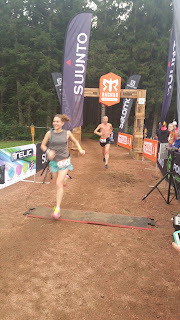 If you are considering running a trail race I would highly recommend actually running on trails. Would I do it again? I've said no in the past and yet I keep coming back. Maybe if my boss pays again.